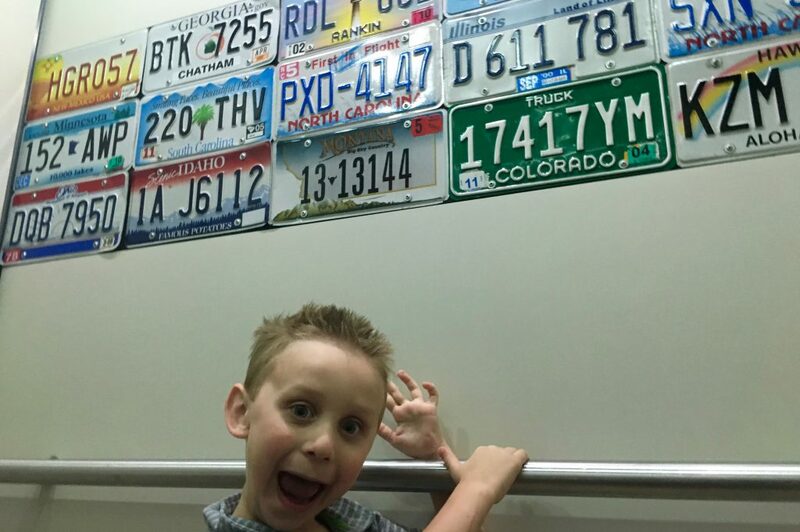 Looking Back on Amazing Trips with the Kids PLUS a HUGE Travel Giveaway! Every year, halfway through December, I get to a point where I get all nostalgic and reflect on the past year. I think about the things that I’ve been able to accomplish with my blog, the milestones and memories that my wife and I have been able to create with the kids and what I can do better moving forward in the new year. 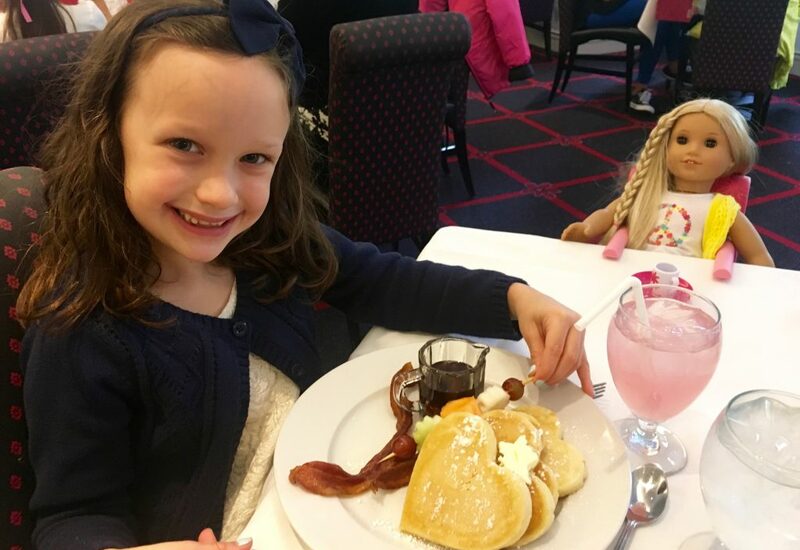 Of all the things that come to mind, I’m particularly fond of the opportunity that I had to spend a little bit of one-on-one time with Ava and Charlie, thanks to my friends at Hilton Homewood/H2 Suites. At the beginning of our #TravelMANager campaign, they encouraged me to do some research on some of their approximately 500 hotels across the nation and think about what a dream weekend might look like for a potential getaway. There were several appealing locations and definitely a handful of cities that I’ve never been able to explore, so this was a tough decision. A hugely rewarding part of this process was incorporating my kids opinions into where we might go. In the end, Ava seemed most excited about visiting one of the two American Girl Flagship stores in the windy city of Chicago and Charlie had his sights set on becoming a cowboy in San Antonio, Texas. Ava and I have breakfast with a creepy, er, beautiful friend. On the surface, it might seem like a tall task – planning, packing and making the necessary arrangements for individual solo trips with a 7 and 5-year old – but I have to say that it turned out to be one of the greatest things we’ve done together this year. 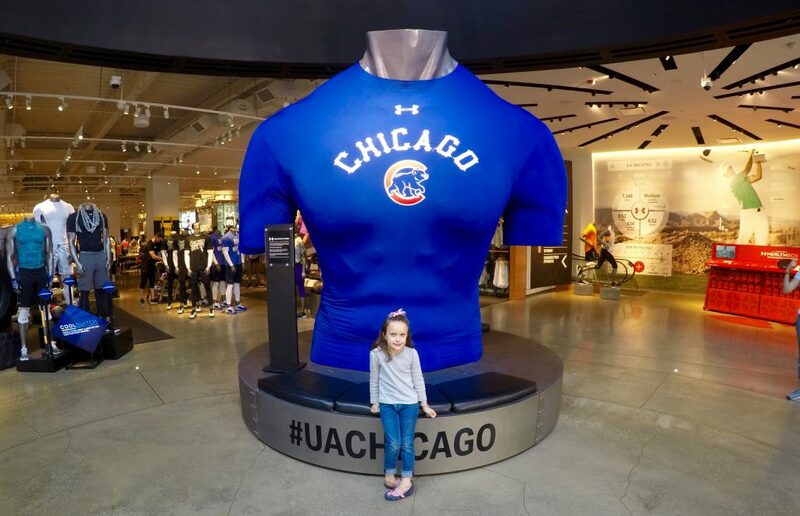 Somehow they molded a replica of my bust inside of a Cubs shirt at the Under Armour store in Chitown. Check the weather before packing. If your kids are anything like mine, aside from them ruining clothing at almost every meal, I somehow forgot that Chicago was on the water and could’ve used a few more sweaters for Ava! Roll up a backpack and jam it into your suitcase. Once you hit the ground at your destination of choice, having a backpack to hold water, snacks and an extra outfit is key. Think about whether or not you’re going to need to travel with a booster seat. Cabs or Uber generally don’t have those on hand and for the safety of your little one, it’s something to consider. Back-up batteries for my camera and phone were KEY once we started beating the street with our feet and jumping from Ubers to trains. Our Chicago trip was one that I’ll never forget and Ava still doesn’t stop talking about it – she continuously asks me to go back. Between, Navy Pier, Ditka’s and riding the red line train to Addison Street just outside of Wrigley, it turns out that Chicago is our kinda town. Cotton candy behind home plate! 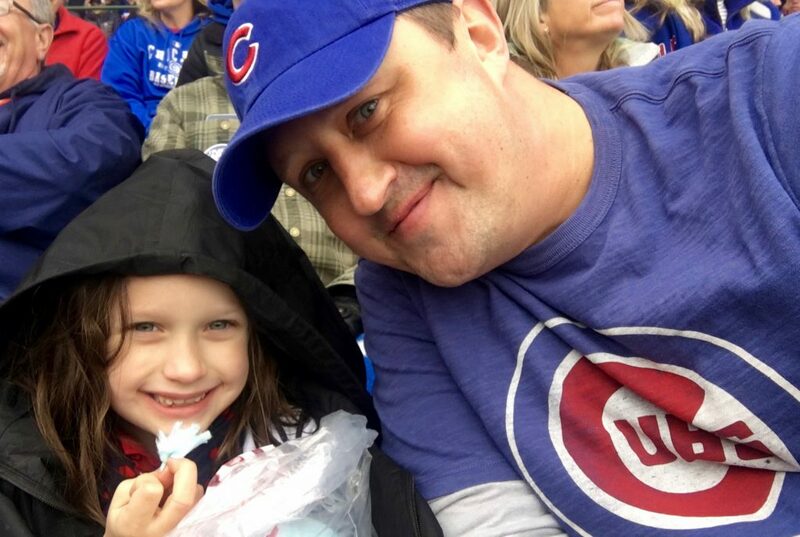 Little did we know that our first visit to Wrigley would be the lucky charm that would take the Cubbies all the way! As it turns out, traveling with a 7-year old versus a 5-year old is vastly different. 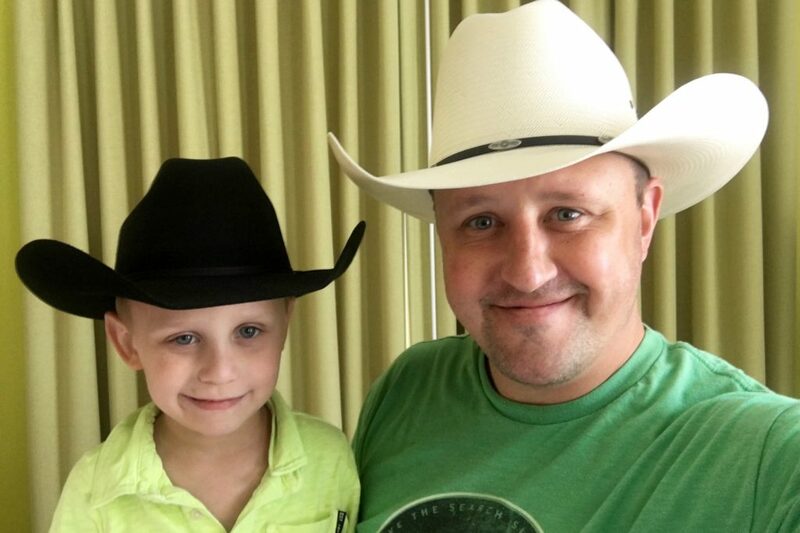 Charlie and I had a great time heading out to San Antonio – even if he couldn’t walk more than 30 steps without needing to throw a tantrum or lie down. Charlie surprised me at our fancy dinner at Restaurant Gwendolyn – he tried boar! We did manage to explore the Riverwalk, visit the famous Paris Hatters, eat local Texas barbeque and after he fell asleep and peed in his pants at a seafood restaurant, had his first unconscious pedicab ride! Despite the various ups and downs involved with each trip, these are moments that will stay with me for a lifetime. In the spirit of the Hilton #TravelMANager and #DadTime campaign and the upcoming Christmas season – we’d like to give something away. Figure out where you want to go! Below you’ll see a link to enter a Dad or Alive raffle. The prize is a 2-night stay at the Homewood Suites by Hilton/H2 Suites by Hilton of your choice in any city in the continental U.S., as well as a $1,500 AMEX gift card to help with your gas, train or flight to your destination. What better way to start the new year than planning a fun weekend with your own family! Simply follow the rules for entry. The contest will end at midnight on Christmas Eve and I’ll announce the winner on Christmas Day! 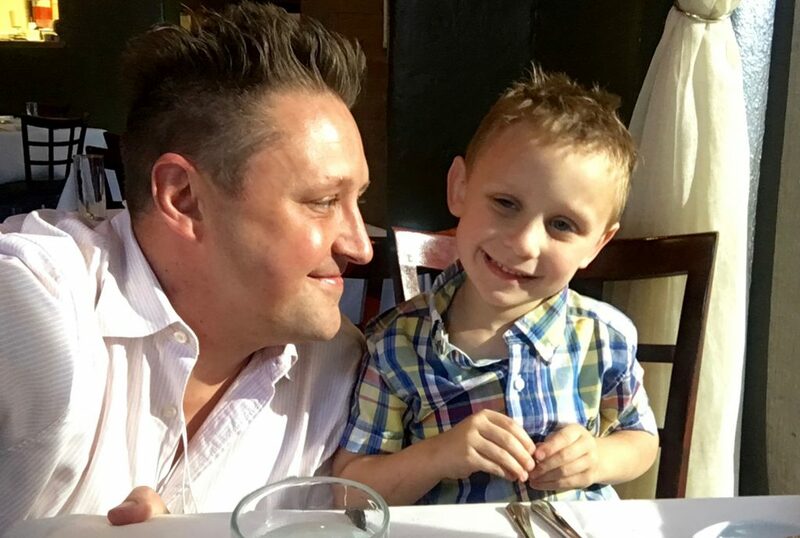 EDITOR’S NOTE: This is a sponsored post on behalf of Homewood Suites by Hilton/H2 Suites by Hilton and the #TravelMANager #DadTime campaign. All thoughts and opinions are my own. Check out their site for more dad travel stories and giveaways! « Santa Loves These Sugar Cookies. I love looking back and also get excited for the trips to come! I love looking back and also looking forward to the trips to come! Thanks for hosting a great giveaway.